Like many others hitting the blog, Mark Plant has just returned from the Micro Focus Universe in Vienna. A favorite city covered by one of his favorite artists Leonard Cohen and his classic Take this waltz. Did he find a bar where the boys have stopped talking because they’ve been sentenced to death by the blues? Far from it. And I’ll dance with you in Vienna…. Actually I walked. A lot. 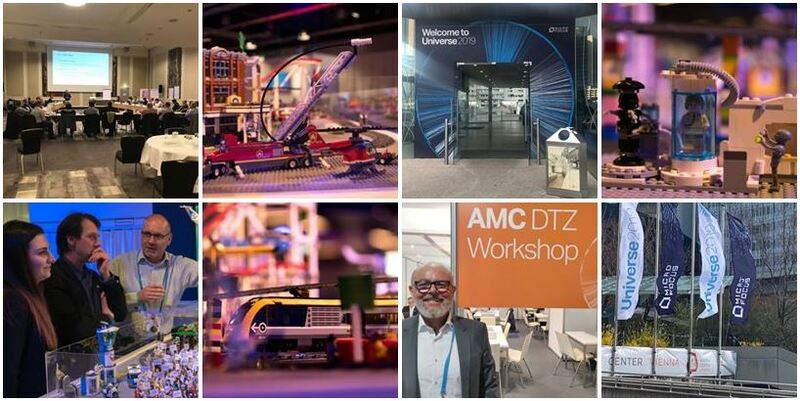 I was there with my colleague Stephanie Wisdom to cover the digital side of a live event so we strolled, ran or lumbered 18 kilometers a day around the Austria Center in Vienna, meeting customers, speakers, dropping in on cracking tech demos and keynote speeches. Generating more than 45 million impressions on Twitter alone in the few days there was tough and we really got going to make sure that those unfortunate folks who couldn’t make it in person could experience some of that technical know-how and wizardry. What does 45 million impressions actually mean I hear you cry? In the region of $2M USD worth of ‘advertising value equivalency’ for a modern business like ours (yes I do know that is a flawed concept) but 45 million pairs of eyes saw our tweets – when we add in LinkedIn, Facebook and Instagram that figure will rise massively. Waltzing was out due to aching legs and my blistered left feet, but Steph and I did reluctantly manage a wiggle with an equally reluctant smile. Physical met digital, old style marketing met new style marketing at the bleeding edge, and cover it we did! The event exploded into action, with energy and buzz that stretched way beyond the confines of the cavernous Austria Center. The Lego installation and Social Media hub provided central points for the staff and attendees to come together in a fun and innovative way, barriers were broken down and the up-till-now somewhat subdued Micro Focus brand leapt into life. Essentially in today’s Social Media world, sharing is caring and that’s what we did, amassing 5000+ posts around Enterprise DevOps, Hybrid IT Management, Security, Risk & Governance and Predictive Analytics, the four intersecting paths to digital transformation. The darker side of a modern city like Vienna was sadly obvious to those travelling to the event every day, past the displaced and homeless living on the streets. The proximity of the U-bahn station to the Austria Center meant that those on their way in and out the glamour of #MicroFocusUniverse probably couldn’t avoid seeing refugees seeking a better life in Europe, along with those who had fallen onto the wrong side of the tracks. And on the first morning after a sumptuous lunch I had an idea that was IMMEDIATELY embraced by the Executive team present. Why not give the surplus food to those in need? We made our ‘sharing is caring’ mantra a reality and donated all left-over event food to the Austrian Red Cross for further distribution to those less fortunate. The speed and efficiency of the small, focused team to accomplish this somewhat whimsical task was extraordinary. A truck was organized and paid for, the Red Cross contacted, and before an hour was up it had all just happened from a standing start. Extraordinary action by an extraordinary team of people and I have never felt prouder to work for Micro Focus, or of my colleagues and managers. Sincere thanks again. So what did I learn personally? I learned that Micro Focus is a company that still puts our wonderful customers front and central to everything we do. While doing that we are great house guests who genuinely want to make a difference to our world, be it technologically or with compassion. We are driven by a common sense of excellence, we are doers, and I think that our blend of bridging older and newer technology is a strategy that bodes well in a World increasingly weary of the pace of technical change. Sure we love new things, but we also love time honored tech like COBOL that just works, day in day out. Who makes older tech work with the brand new tech? We do, because we are all real geeks. Find me on Twitter, find our albums on Facebook and find a Micro Focus event to attend near you soon. And if you want to see all the real action from Micro Focus Universe 2019, register for the on-demand version right here. Our products really do speak for themselves so you won’t be disappointed, although some of the content may still be in the process of being polished and uploaded so check back often.